Robert Dickson, Jr., works with his father and brother on a 600-acre farm a few miles outside Lawrenceburg, Tenn. In 2014, he purchased an Air Evac Lifeteam membership. As a member of the Tennessee Farm Bureau, Dickson received a $10 discount on the membership. “It was the best $55 I ever spent,” he said. Less than a year later, that membership paid off. On September 2, 2015, Dickson was working on the farm with this father and brother when the unthinkable happened. Robert used a belt – a gift from his sister, Rita – as a tourniquet. Lawrence County EMS and the Henryville Volunteer Fire Department arrived at the scene and called for the Lawrenceburg, Tenn., Air Evac Lifeteam crew to transport Dickson. Rita said the Air Evac crew arrived at the farm in minutes. Dickson never lost consciousness, even though he lost a great deal of blood. In a medical emergency, time is everything. 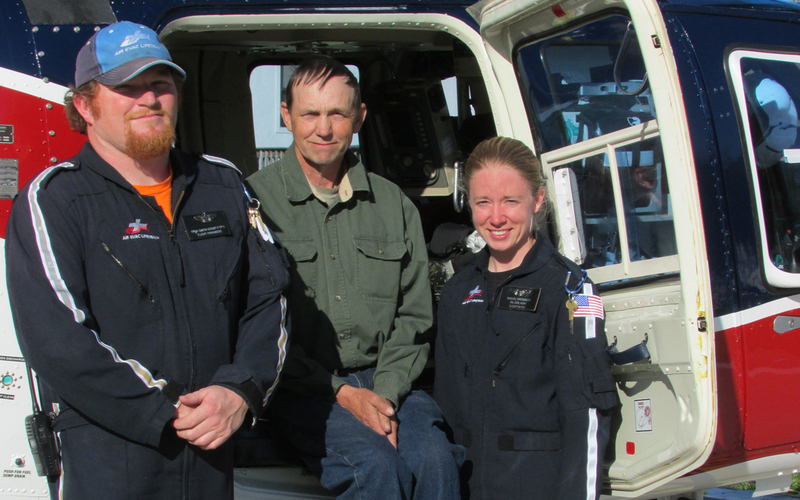 The Air Evac crew of pilot Jeremy Davis, flight nurse Raquel Creekmore and flight paramedic Ryan Smith flew Dickson to Vanderbilt University Medical Center in Nashville. Air Evac is available 24 hours a day, seven days a week to land at the scene of an emergency or transport patients between medical facilities. The Lawrenceburg Air Evac base opened in July 2012 and is one of 11 bases in the state of Tennessee. “Thank God for Air Evac, or he would have died,” Rita said. Dickson spent 11 days at the hospital, following surgeries to place rods in his leg and remove muscles from his torso to rebuild the leg. “He went to a rehab facility after that, and came home on his birthday – October 19,” Rita said. Dickson is still recovering, and he’s slowly getting back to farming. He’s also an advocate for Air Evac Lifeteam membership program.